I was blind for 3 weeks. Jim's Complete Radio & TV History available at Jim Rotondo's TV Bio. Jim Rotondo's CD Single "Hand Squeezed & Tired of Pumps"
The "Italian Virtuoso" was born in Philadelphia, PA many, many years ago and resided in Southern California from July 2, 1970 thru July 5, 1990. It was here that his gift of "manualism" was born, the unique ability to play songs by simply squeezing the palms of his hands together (that's "handfart" music to my Southern friends...). 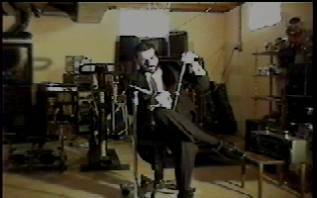 "Luciano" can also play songs by controlling the air flow from the nozzle of a bicycle tire pump (K-Mart Black, $9.99). 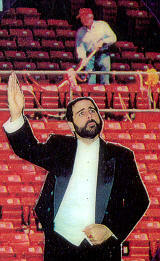 The Maestro has performed in many comedy clubs, churches, retirement homes, prisons and TV Shows. Pavaroddy's musical comedy act can be 5, 7, 10, 15, 20, 30, and 45 minutes in length and can be customized for virtually any occasion or audience of any age. 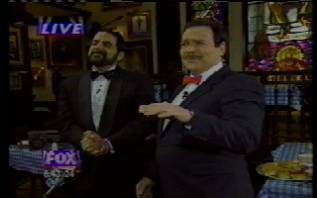 In December of 2000 Jim joined forces with "The Handman" Bruce Gaston, and World-Class Hand Whistler Ben Brenner to form "The Three Tendons". This trio appeared on "The Tonight Show with Jay Leno" on February 15, 2001. The rest is history -- cause herstory is too long. We Finally Found the Long Lost Pavaroddy Tracks via Real Audio! thanks to Real Producer & a $50 Radio Shack microphone! What? No Real Audio? Download it NOW! Green Acres Summer, 2001 on my laptop's Sound Recorder. "25 of 6 to 4" Hands, Lead Tirepump, Chipmunk Vocals, 1999. "Colour My World" Just the Tirepump Solo with Hand accompaniment, 1999. "The Entertainer" Hand Squeezed with Piano accompaniment, 2000. "Over the Rainbow" Tire Pump w/ accompaniment by Carmen J. Rotondo (Dad), 2000. The Hooterville Rubber Band The Class of 2002 will be sorry they graduated! Hear Verse 1 of JJ Cool L's "Shootin' Blanks Rap"
circa 1985, via Real Audio.